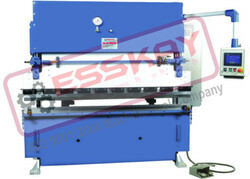 We offer wide range of Hydraulic Press Brake Machine which are easy to maintain, versatile and have low tooling cost. 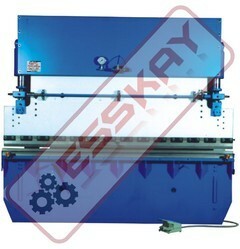 The all steel structure ensures robust Press Brake Body. Our Hydraulic Press Brake are designed to operate on low pressure, as compared to many of our competitors who design their press brake to operate on high pressure which may result in damage of seals, thereby affecting its accuracy and further may result in leakage. our design facilitates leak proof and accurate operation even under load higher than nominal limit. The standard bending length is 2500 mm and 3050 mm, longer machines upto 7000 mm(7 mtr) can be manuafctured as per customer requirement. Computer Numerical Control (CNC) Hydraulic Press Brake Machine. Numerical Control (NC)Hydraulic Press Brake Machine. Conventional (Manual Back Gauge)Hydraulic Press Brake Machine. Single Axis (X axis) Automatic back gauge controlled by the CNC controller with high lead ball screw/ LM guide ways for X movement. Pair of Front sheet supports with adjustable height feature. Hardened & ground Anti deflection intermediate tooling (with tapered wedges adjustable from the front) in upper beam to compensate for press brake crowning. Electric motor, Control Panel, Ergonomically designed Operator's console housing the CNC controller. Single Axis (X) back gauge Controlled by the CNC with high lead ball screw and LM Guideways. Cylinders from high quality forged steel are precisely honed.Piston rods are hard chromed for longer life. Rigid structure with interlocking design ensures minimum deflection even under maximum load. Hardened and Ground, Anti Deflection intermediate tooling with taper wedge. (Only available with smaller tonnage machines. Ergonomically designed operator's console housing the CNC controller. Electric Control Panel with isolation transformer. One suitable 5-way Die and punch - Hardened and Ground. Mobile foot switch station with emergency stop. Safety Laser Curtain for operator's safety. One set of die-block with multi 'V' grooves and straight upper blade issupplied with the machine. Multiple clamps provided to assist clamping ofsegmented top tool. Toolings as per job applications can be suggested and supplied (Optional). Also hardened and ground toolings can be providedupon request. Straight, Semi-goose Neck & Goose Neck tooling available. Flexibility of using single V, 2-V & Hemming Die on the same base block. All the Press Brakes have an inherent tendency of deflection under load. To eliminate this, there are different ways to compensate the deflection. One of the most widely used method is to use anti-deflection tooling in upper beam.Our Machines come with hardened and ground anti deflection tooling with tapered wedges that can be set from front side of the machine. Dead Stop arrangement for accurate bending with 0.01mm repeatability which ensures the same bend angle in each stroke. Stroke Length can be preset. Numerically controlled back gauge from front side of the machine. Cylinders from high quality forged steel are precisely honed. Piston reds are hard chromed for longer life. Electric Control Panel with selection of auto, Inch and single cycle Auto mode operation. Mechanical stop and steel torsion bar to maintain synchronization and high precision. One suitable 5-way Die and punch. 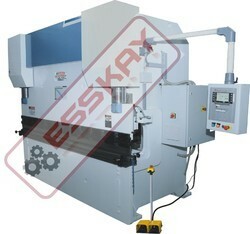 Extra Tooling set as per customer requirement. 7" full Color TFT Touch screen display. -Machine control such as Ram up, Ram Down, B/G forward , B.G reverse can be done on the screen. -Batch program can be created/modified easily by single touch. Both the cylinders (Y1 & Y2) are synchronized with the help of torsion bar and links. This arrangement is used to bring the upper beam parallel to the bed all through the stroke. 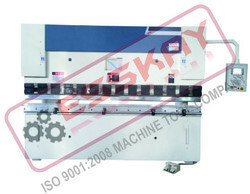 One set of die block with multi 'V' Grooves and straight upper blade is supplied with the machine. Multiple clamps provided to assist clamping of segmented top tool. Toolings as per job applications can be suggested and supplied (optional) . Also hardened and ground toolings can be provided upon request. All our cylinders are manufactured in house using UT seamless tubes. Bore of the cylinder is precisely honed to mirror finish to main dimensional accuracy and long seal life. Cylinder rodID ground and hard chrome platedfor scratch proof operation. World class seal kit is used for leak proof operation. Electric motor pumps, values, hydraulic hoses pipelines and fittings are used of reputed make for better reliability of the machine. Glycerine filled stainless steel body pressure gauge is provided to watch the bending pressure. Additionally the required pressure may also be set using the knob. Machine can be operated using a foot switch in both auto as well as manual cycle. Two separate padels are provided for up and down operation which gives better safety. All our cylinders are manufactured in house using UT seamless tubes. Bore of the cylinder is precisely honed to mirror finish to main dimensional accuracy and long seal life. Cylinder rod ID ground and hard chrome plated for scratch proof operation. World class seal kit is used for leak proof operation. Looking for Hydraulic Press Brake Machine ?